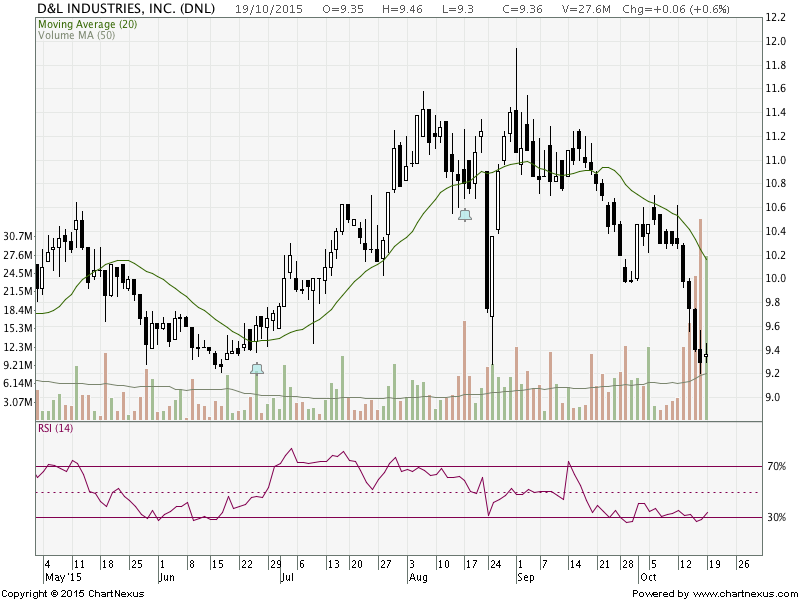 DNL is one stock that has everyone asking if it has already bottomed out (short-term). Many like the stock as it really hadn’t disappointed investors (not until very recently anyway)—the relatively low (long-term) volatility in the past months/year had made the asset tractable; the trend had been pretty apparent. It was considered a “safe” bet. The chart below shows its dynamics from March 2014 to mid-August 2015. Alas, as with all good things, the positive trend didn’t really last; it has been stalling. 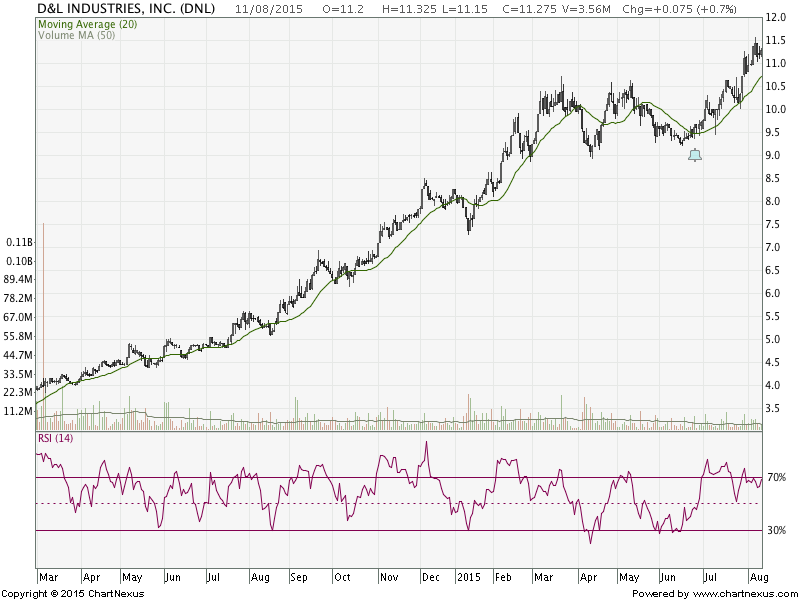 Things started to reverse almost immediately after its most recent ex-dividend date in August. What’s alarming is that the sharp declines have been accompanied with high volumes—a classic case of capitulation a.k.a. panic selling. I can only surmise how difficult it has been for its investors to actually gulp down what has been happening (just think of the opportunity cost for those have opted to go long). I feel that many are still in denial. It’s completely understandable—I mean, with DNL’s epic rise, people (especially those who had made some money off it) have such a good impression of the company. Its loyal investors are convinced that all this is temporary and that it will recover very, very soon—much sooner than expected… so they’re still holding on to it. So, has it bottomed out yet? I’m curious about this myself as I like the company and I want to reinvest in it. To be honest, it’s really hard to tell at this point. For me, I need to see the stock trade at a much narrower range; a sideways movement in the next few trading days, at the very least, could hint to a possible reversal. Note that after nine trading days, today is the first time we’re seeing a hollow/green candlestick—it doesn’t say much, but it does tell us that the bulls are trying their best to keep the price from sliding further. I would love for it to stay above ₱9.10/sh. 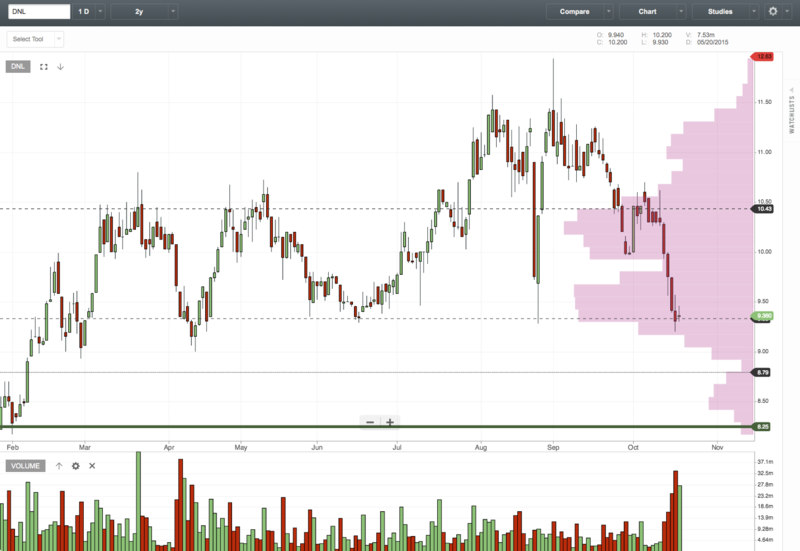 Hopefully, it doesn’t break support; or else, it won’t be unexpected to see it trading around the ₱8.25/sh-₱8.80/sh range. As mentioned, the bulls have been trying to keep the price from declining further. Who is/are leading the herd? The last I checked (PSE Edge), the Lao family has started buying shares. Check the company disclosures: Statement(s) of Changes in Beneficial Ownership of Securities at the PSE Edge website. The company and its owners have been filing and filling out PSE form 17-7 since 26 August 2015. The latest disclosure is dated today, Oct 19, 2015—divulging that principal stockholders acquired an additional of 300,000 shares at ₱9.32/sh. This entry was posted on October 19, 2015 by E in Stock Trading and tagged Bottomfish, Capitulation, DNL, PSE, Stock Trading.